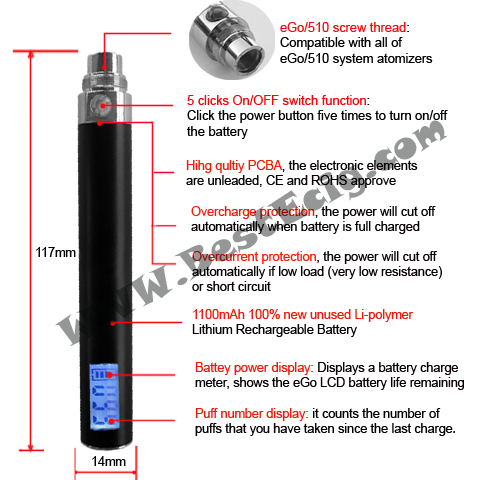 The eGo LCD MEGA battery with LCD display, 1100mAh manual rechargeable battery and 5 clicks On/OFF switch, shows you remaining eGo battery life and how many "puffs" you have taken since last charging process. Display has backlight clearly visible. 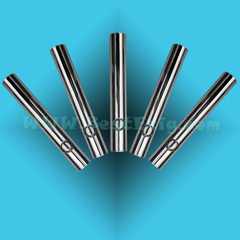 Can be used in all of eGo series models and MEGAs eGo, eGo-T, eGo-C, eGo-W, eGo CE4/CE5/CE6, Protank, H2, and other eGo series models). 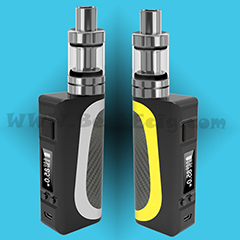 The eGo LCD MEGA 1100mAh battery with LCD display and 5 clicks On/OFF switch, shows you remaining battery life and how many "puffs" you have taken since last charging process. Display has backlight clearly visible in the night while you press the eGo LCD MEGA battery button. "Puffs" counter counts to "999" and resets to "0" ONLY in the charging time, you can reset it too. 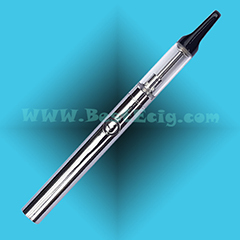 Can be used in the regular eGo, eGo-T, eGo-C, eGo-W, eGo CE4, eGo CE5, eGo CE6, eGo Mini Protank, eGo H2, eGo type A e-cigarettes and their mega batteries and other eGo series models. --1. Battey power display: displays a battery charge meter, shows the battery life remaining, so no more guessing when you need to recharge. --2. 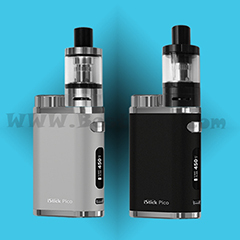 LCD have puff number display: it counts the number of puffs that you have taken since the last charge, the puff counter is excellent in that you can now really keep track of your nicotine intake and monitor how much you are vaping. --3. 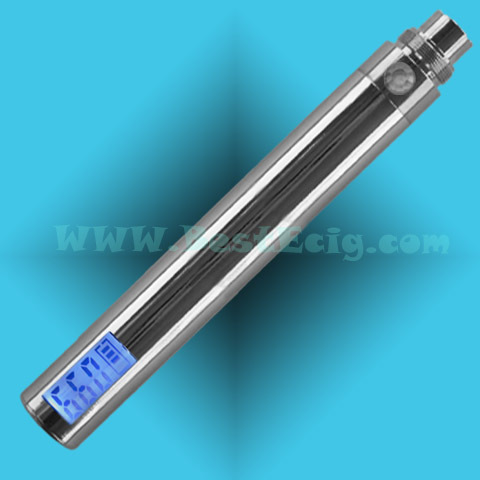 Display has backlight clearly visible in the night while you press the eGo LCD MEGA battery button. --4. 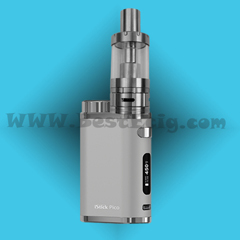 5-click safety cutoff: click the power button five times to turn off the eGo LCD MEGA battery and five times again to turn on the eGo LCD MEGA battery. 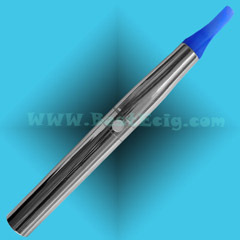 This is a very convenient option if you typically carry your electronic cigarette in your pocket or purse. 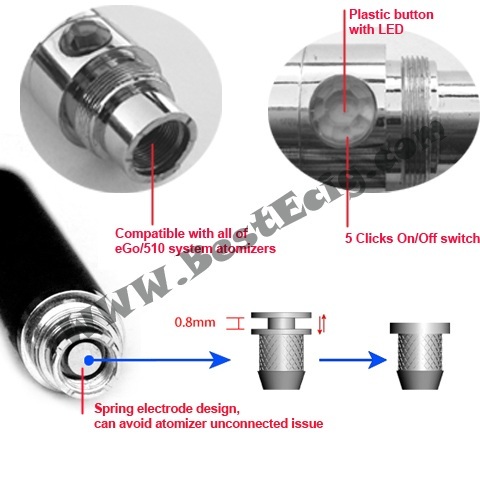 What atomizers/cartomizers can used in eGo LCD MEGA 1100mAh battery? 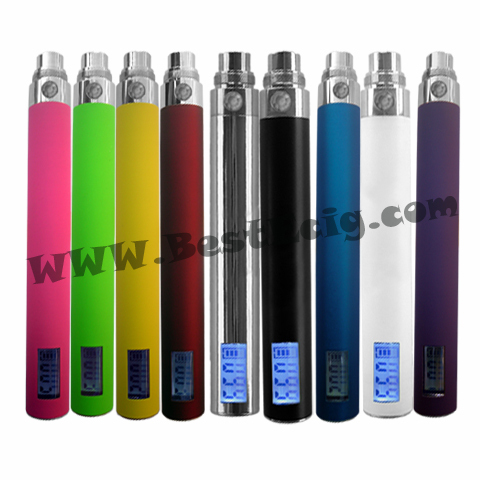 The e-cig eGo LCD MEGA 1100mAh battery can work in eGo-T atomizers, eGo CE4 cartomizers, eGo CE5 cartomizer , eGo CE6 cartomizer, eGo Mini Protank Glassomizer, eGo H2 Clearomizer, eGo-C atomizer, eGo-W cartomizers, 510 atomizers, eGo atomizers, 510 MEGA atomizer, eGo MEGA atomizers, 510 cartomizers, eGo cartomizers, eGo type A atomizers, Nautilus BDC Adjustable Airflow Clearomizer, ect. --2. 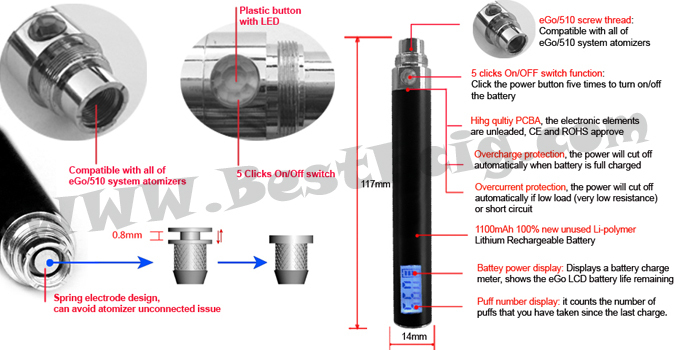 Work: crew and connect the atomizer(eGo, eGo type A, eGo-T, eGo-C, eGo-W, ect) with the eGo LCD MEGA battery, then they will be stand-by state, The LCD eGo works only when you press the eGo LED MEGA battery power button. Press the LED power button and inhale at the same time. 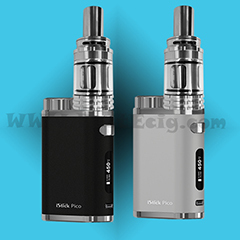 1), The " Puffs" counter will count to "0" when you charge the eGo LCD MEGA battery. 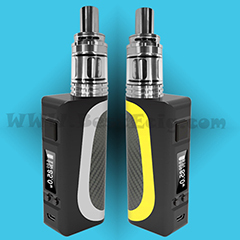 2), Click the power button five times to turn off the battery, then press the power botton for 5 seconds, the LCD backlight lights, and then click the power button five times again to turn on the battery, the " Puffs" counter will count to "0". --4.Charge: if the LCD charge meter displys low power, it's time to charge the eGo MEGA battery, you just screw the eGo LCD MEGA battery with the USB charger, then plug it into the PC or AC-USB Adapter. 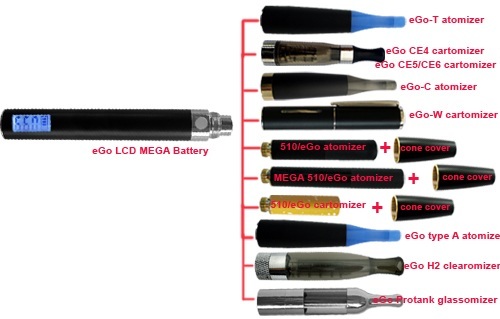 *Tips: All of eGo series batteries: 650mAh eGo battery, 1100mAh mega eGo battery, eGo LCD 650mAh battery, eGo LCD MEGA 1100mAh battery) charged by the same eGo USB charger.